We are a country that enjoys commemorating achievements in all shapes and sizes. Some call it the American spirit while others might call it an attempt to ensure that the sacrifices of those that have gone before us are remembered long after they are no longer walking amongst us. This past Monday was set aside by Major League Baseball to pay homage to an achievement of courage and determination as part of the annual Jackie Robinson Day. 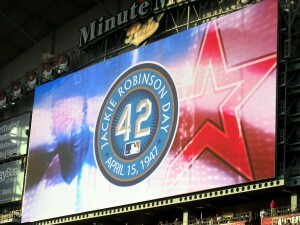 Each year on April 15 Major League Baseball teams stop to remember Jackie Robinson. On April 15, 1947 Jackie Robinson became the first African American to step foot on a Major League Baseball field when he suited up for the Brooklyn Dodgers. The world of baseball for Jackie Robinson, and many other players like him, was far different from the world of baseball today. I am not referring to jumbo trons and jumbo hot dogs or any of the other things that have found their way into the modern game. I am not even talking about the designated hitter. Prior to 1947 there were no minority players in the highest level of professional baseball. It took an owner willing to do what others wouldn’t in Branch Rickey and a player willing to withstand insults from on the field and in the stands in Jackie Robinson to pave the way for those that came behind them. For people of a certain age, like me, it is nearly impossible to picture a segregated baseball diamond. From my earliest recollections there were people of all shapes and sizes and races on the field. 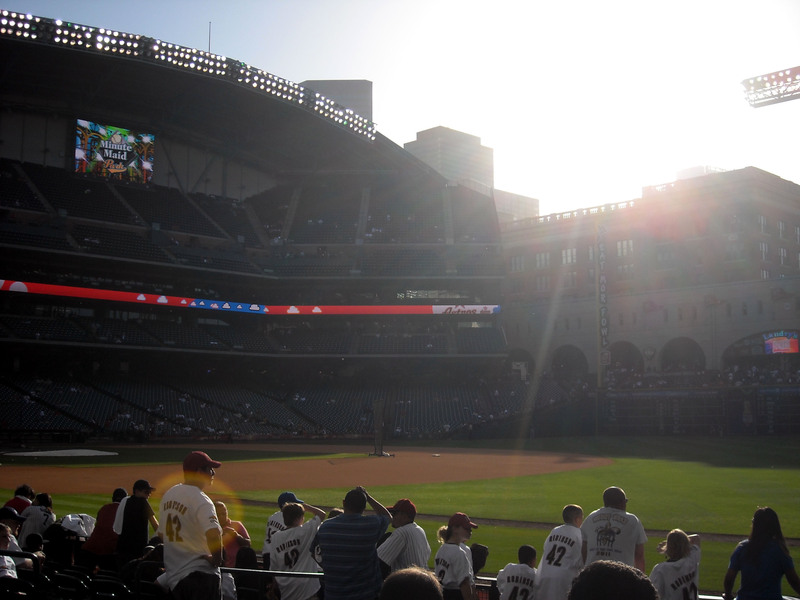 Jackie Robinson Day at Minute Maid Park. Look at the rosters of the 30 MLB teams today and one will find players from six continents. None of that would have been possible without someone taking the first step to desegregate the diamond. So it is fitting to take time to honor Jackie Robinson’s sacrifice and to ensure that generations who were not alive back in 1947 can learn the story and know that without the sacrifices of people like Jackie Robinson the world would be an entirely different place. One of my favorite quotes is “Those who cannot remember the past are condemned to repeat it.” It was first stated in the early 20th century by George Santayana, but the phrase is still as true today as it was when first spoken. Society must continue to learn from history so as not to repeat the mistakes of the past. 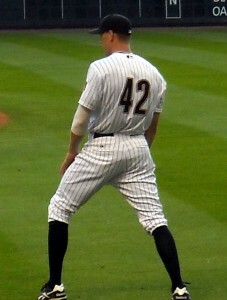 Hunter Pence of the Houston Astros celebrates Jackie Robinson Day in 2011. As another outlet to learn from the mistakes of the past this week also marks the release of the movie 42 which provides a big screen treatment of the momentous event and allows generations who were not alive in Jackie Robinson’s time to see what it was like. As part of Jackie Robinson Day each player on every team wears the number 42 as a show of respect and solidarity. Of course one player still wears the number 42 every game but more on that in a bit. While each team celebrated the moment in their own way the main celebration occurred in Los Angeles, CA where Jackie’s widow was in attendance at Dodger Stadium in Los Angeles. During the annual celebration of Jackie Robinson there are always a select few who will state in various outlets that the inclusion of Jackie Robinson in the Baseball Hall of Fame was based solely on him being first to break the color barrier and is not reflective of his playing ability. Of course, a quick look at his career statistics show that based on the merits of his play alone Jackie Robinson is every bit of a Hall of Fame caliber player and is included as much for what he did as a player as well as what he did as a trailblazer. In 1997 all 30 MLB teams were told to retire the number 42 in honor of Jackie Robinson. 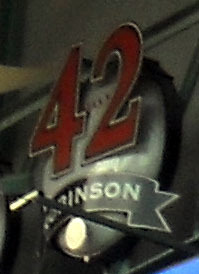 In 1997 Major League Baseball retired the number 42 on all teams in honor of Jackie Robinson. As part of the retirement players who were still wearing the number were grandfathered in and allowed to keep wearing it for the remainder of their careers. 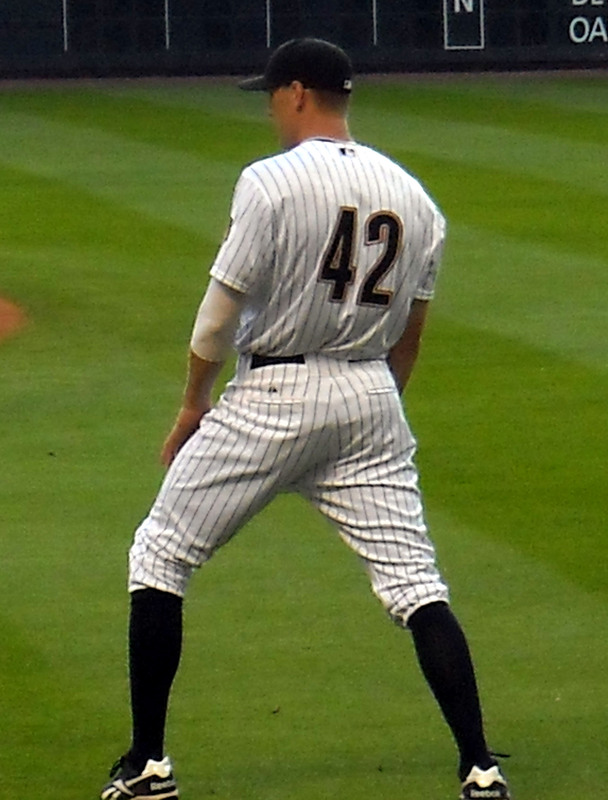 Currently Mariano Rivera of the New York Yankees is the only active player still wearing the number 42. Rivera is expected to retire at the end of this season so the number 42 will be officially retired 15 years after the announcement to retire it was made. This means that starting in 2014, no player will ever again wear the number 42 in Major League Baseball. It is likely that the Yankees will retire Rivera’s number as well based on his impressive body of work. That will lead to the hanging of two 42 banners in Yankee Stadium with one for Robinson and one for Rivera. Then again the Yankees always did like to be a little different. Of course this years celebration of Jackie Robinson Day was marred by the cowardly act of the Boston Marathon bomber. At the time of the bombing only one MLB game had been completed with the Boston Red Sox and the visiting Tampa Bay Rays wrapping things up shortly before the first bomb was detonated. The remaining MLB games Monday featured moments of silence for the victims of the attack. Acts like the bombing of innocent bystanders at the Boston Marathon show that the world is still as full of hate today as it was on that April day in 1947. But just as was the case in 1947, there are still people willing to rise above the hatred and do what is right. And that is something worth remembering every day. Now if you’ll excuse me, I am off to catch a screening of 42, perhaps I will see you there.